Follow us on Facebook or Twitter!! Not only do the river tours offer the very best way to get up close and personal to the eagles (without disturbing them) the custom designed Safari boat is also climate controlled and heated. This means guests have incredible wildlife adventures despite the weather. All tours are fully interpreted by knowledgeable staff. 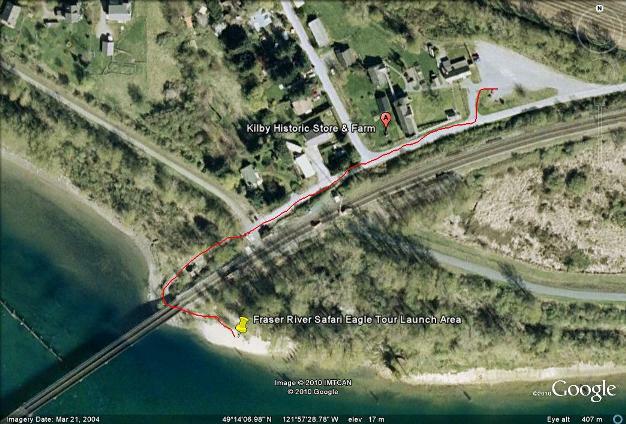 Where to meet: The rendezvous location will be under the Kilby Train Bridge in Harrison Mills about 400 meters from Kilby Historic Site (down the dead end “no exit” Kilby Rd in Harrison Mills). At the Junction of Kilby and Kilby Road continue straight to the gate and walk down the path under the train bridge. We are NOT at the boat launch in the park. Picture directions below.